I finished this dress just yesterday and couldn't wait to share it with you all! 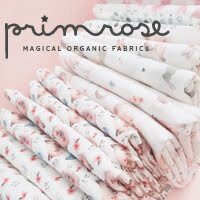 This is a project which started with the fabric which is unusual for me as I don't tend to buy fabric without a specific project in mind. But I couldn't resist the texture and colouring of this linen/cotton plaid from The Fabric Store last time I ordered! They have had some beautiful checks and stripes in stock recently. 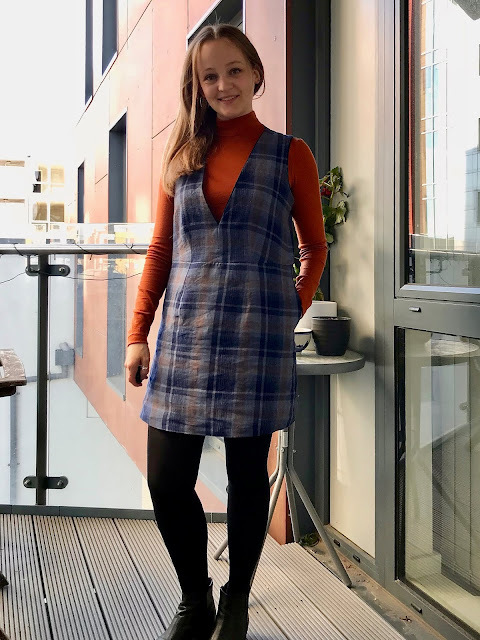 When I chose it I actually had in mind a relaxed pair of overalls or a jumpsuit for winter layering like this beauty from Common Stitch but I was hesitant about how confident I would feel wearing that much plaid! 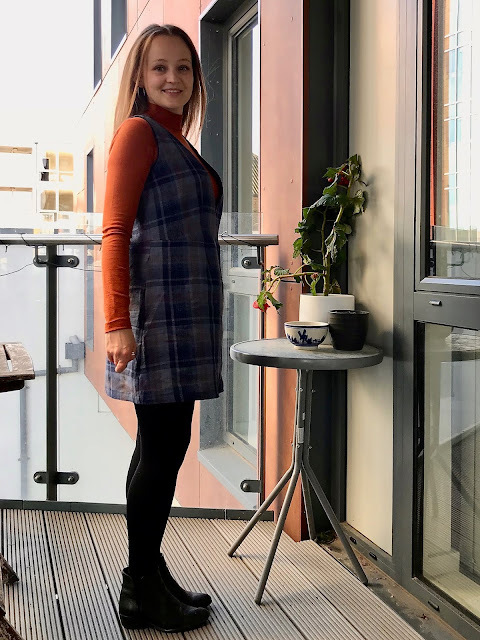 Then the Dani Dress was released with this month's issue of Seamwork Magazine and I knew there was a place for that in my wardrobe! I've actually had some real sewing time over the last couple of weeks and despite the urge to rush through the queue of ideas that has been building up in my brain over the last few months I've tried to take #slowfashionoctober to heart, make considered choices and take my time over each project to ensure it turns out just the way I want it. The sustainability of my sewing and whether I really need to be sewing more and MORE clothes has been on my mind a lot recently. 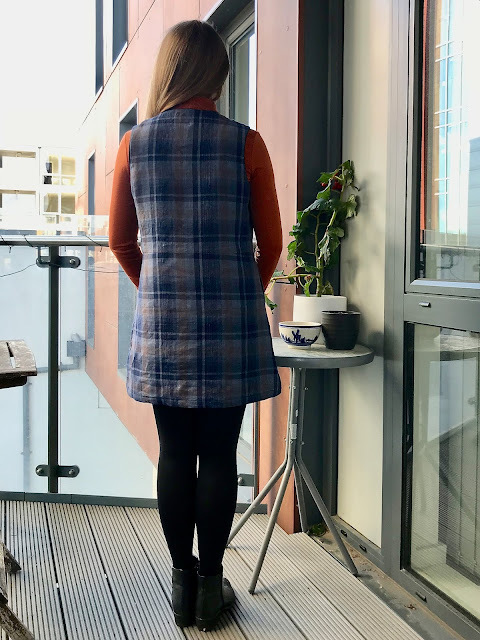 I sew mainly for the pleasure of sewing rather than the garment at the end of it and don't want to spend any less time doing it as I get so much out of it. But I think what I can do is put more thought and time into garments and the techniques I use to whittle out those projects which I won't end up wearing as much because they didn't turn out quite the way I hoped. Anyway, I could write a whole post about that and may do in future, but my point is that on this project I did slow down and introduce some more time consuming techniques and details and not only am I delighted with the result but I feel like I really got back to enjoying the process of making something. 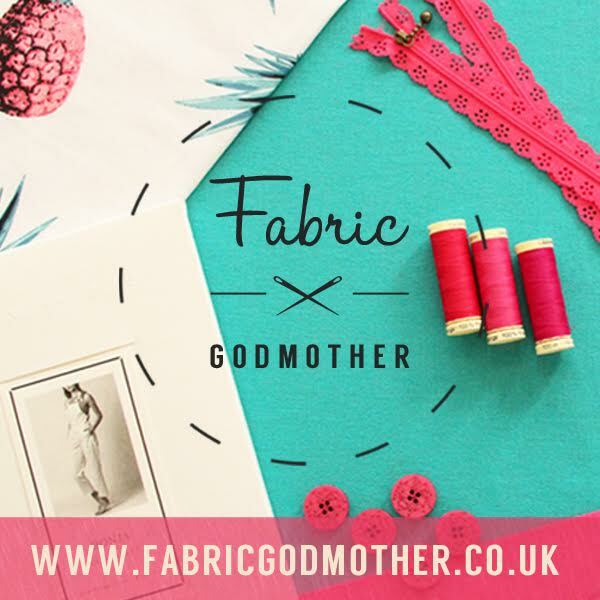 I've been so busy this year that I think when I have sewn I've almost rushed through with my mind on what the next project is going to be! It was lovely to be absorbed in the present moment for a change. When I ordered the fabric I thought it would be fun to try out some of The Fabric Store's pre-made bias binding which they offer in linen and selected Liberty prints, so ordered some in navy to match. 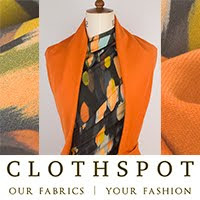 (I also took advantage of their thread matching service for the merino which was fantastic!) I was thinking I could use the bias binding to edge overall straps or pockets but when I changed my plan to the dress I rethought. 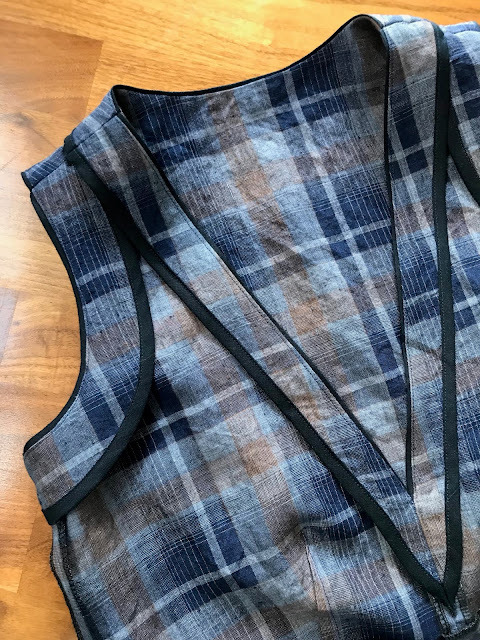 I used it to add flat piping along the neckline and armholes and omitted the lining of the dress so I could use the bias to finish the raw edges of the facings and pocket bags. I love how both of these things have turned out, I almost want to wear the dress inside out! The dark piped edge gives definition to that lovely deep neckline and lifts the whole dress. It has been a while since I have lavished so much attention and time on my interior finish but it is so worthwhile. 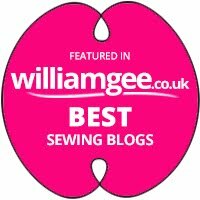 I think having an overlocker has made me lazy! I think I've particularly shied away from a bound finish as it can be so time consuming and fiddly. But not having to make the binding myself was so enjoyable. I'll definitely be ordering more for future projects. It was a dream to work with as the pressed edges are so crisp and easy to follow. To use the binding for piping and reduce bulk in the seam, I pressed the two outside folds of the binding open so I just had a long strip pressed in half along the length. As the binding is 3/4" like this and I was using a 5/8" seam allowance I could line up the raw edge of the binding with the raw edge of the neckline/armhole and be left with a nice and even 1/8" of piping showing. The other thing that really forced me to slow down with this dress was attempting to pattern match that plaid. It was a particularly tricky one to match as it is not symmetrical. It is more like a repeat pattern of squares with various lines running through them. I concentrated on getting the darker lines in the check to run right the way down the dress and for the pattern to match across the bodice and am delighted with how this has turned out. It isn't perfect in a few places but is hard to spot! The one place it was a bit of a disaster is down one of the skirt seams which I am frustrated by. I got impatient and cut those pieces on the fold instead of tracing them out and cutting flat. At the beginning of the project I don't think I had yet found my slow sewing groove! The crisp linen/cotton blend has a slightly slub and lovely crisp hand which works well to show off the shape and clean lines of this dress but it does rumple the second I move in it! I really like the subtlety and depth of the check created by the yarn dyed weave and the rusty brown colour running through it. In the same order as this plaid was a piece of paprika merino and when they arrived folded up next to each other I loved the way the merino picked out this rusty stripe. I decided to make a top to layer under the dress out of the merino and this is my first True Bias Nikko Top with sleeves. 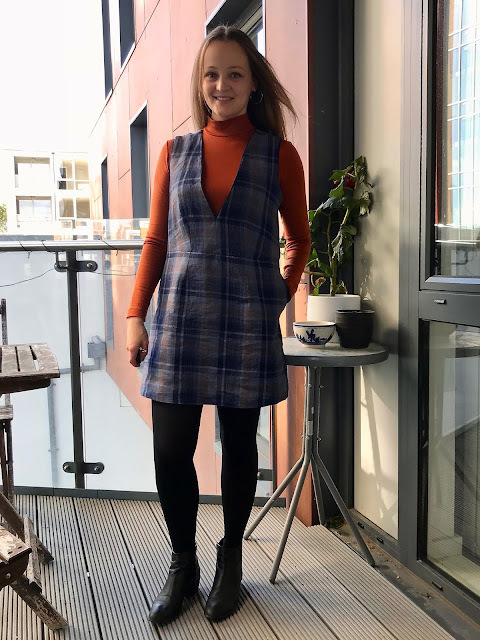 I love it possibly even more than the sleeveless version and have also made one in black as they are going to be so great for layering underneath overalls and dresses through the colder months. I cut the size 4 of this, grading out to a 6 at the hips and am happy with the fit especially through the shoulder. I could possibly do with a little less length in the sleeve but like to be cosy! As much as I am delighted with the finished dress I didn't think all that much of the instructions and some of the construction methods. At some stages the illustrations didn't match what the garment looked like in front of you and just served to confuse matters rather than clarify what you were doing. The instructions and illustrations for the pockets I found quite confusing in particular. 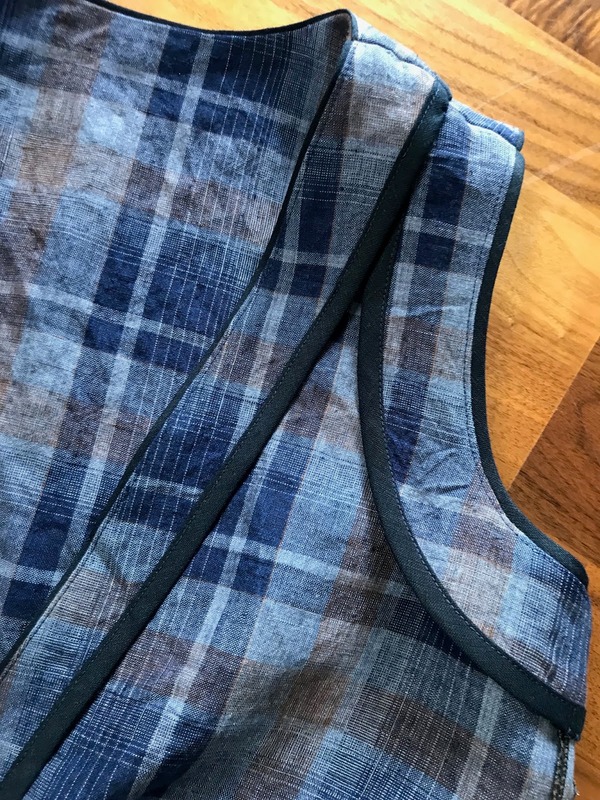 They're put together in a different way to how I have sewn side seam pockets before but once I figured it out I did really like the technique and the fact that the bags are sewn into the waist seam so they stay nice and flat inside the skirt. The pocket openings are quite small and neat but the bags are nice and roomy which is just what I like! 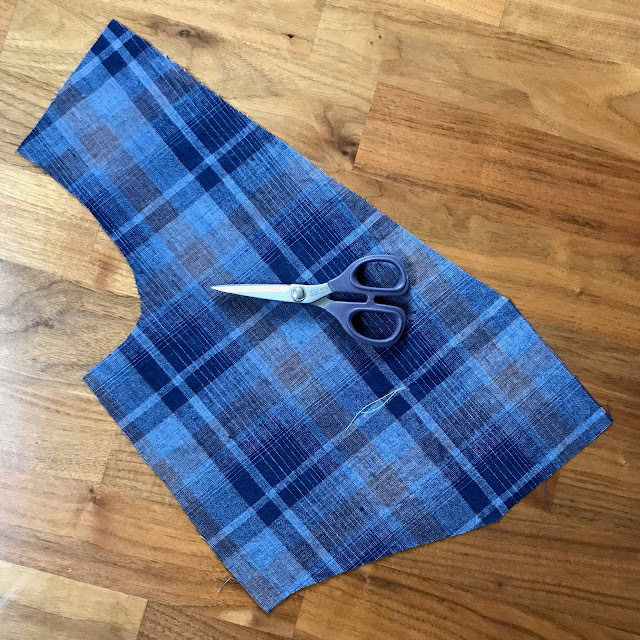 The pattern instructs you to press the skirt side seams open but I chose to press them closed as it created a smoother finish on the outside where the pocket bags meet the side seam. My seam allowances are bulkier than they would usually be because of the bound edges. There is no fastening to contend with as this slips straight on over the head. The trickiest part of the construction is the neckline and getting that point nice and sharp, I made this even harder for myself by including the piping! I would recommend finishing your seam allowances before sewing the seams (with the exception of the skirt side seams and waistband as it makes it easier to access everything. 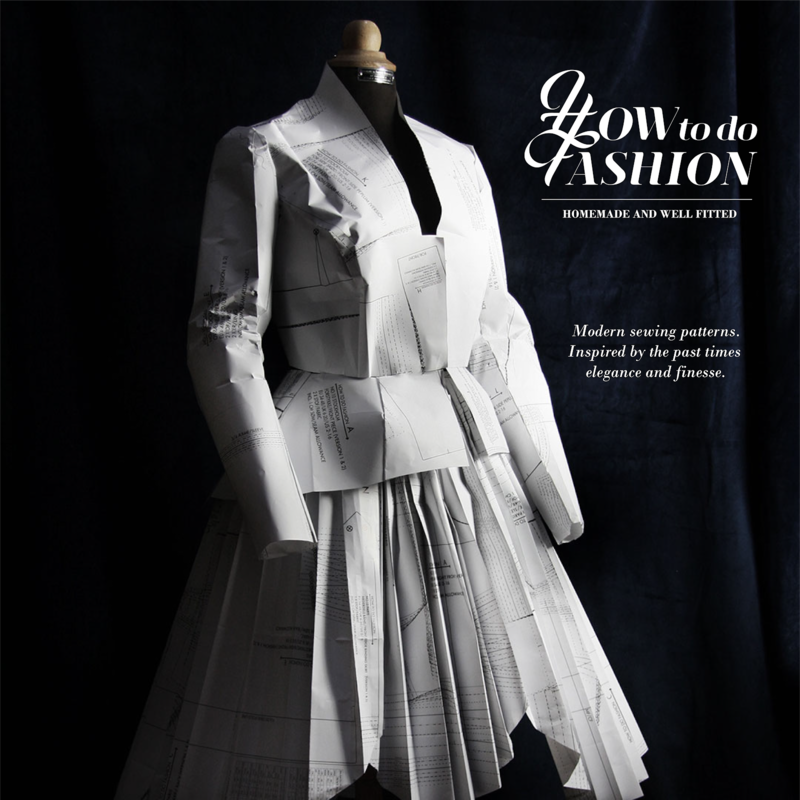 I sewed everything by machine with the exception of tacking down the facings by hand at the shoulders, side seams and centre front to help everything lay flat. The under stitching and a good press really helps with this anyway. 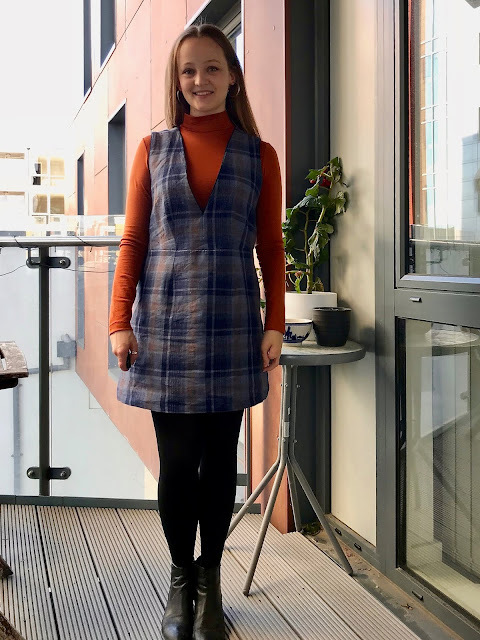 This style took me a bit of wearing around the house to get used to as it has a lot of ease and I'm used to more fitted dress styles, particularly around the waist. But now I'm really enjoying it as a layering piece. 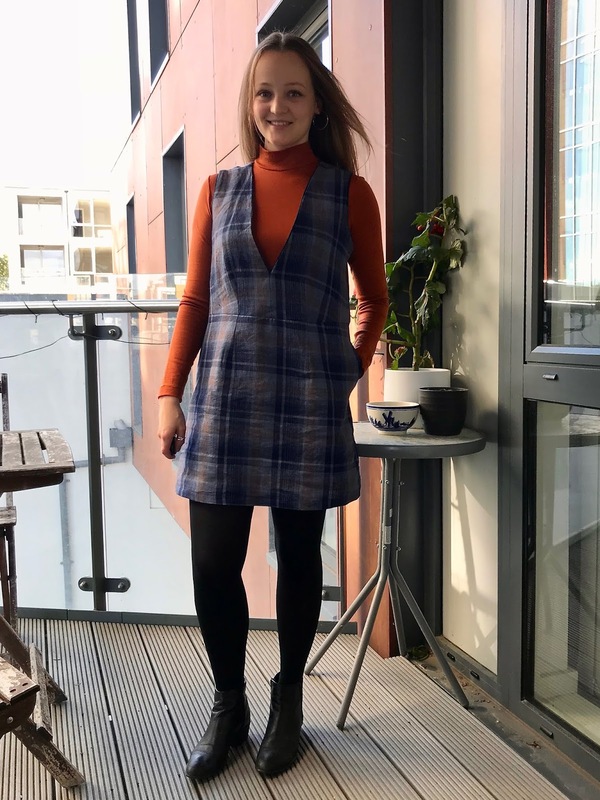 The pattern description does suggest that it can be worn on its own but with a neckline plunging that low there's no way I'm wearing this without a top underneath! It is also quite a short style, worth bearing in mind if you're taller. 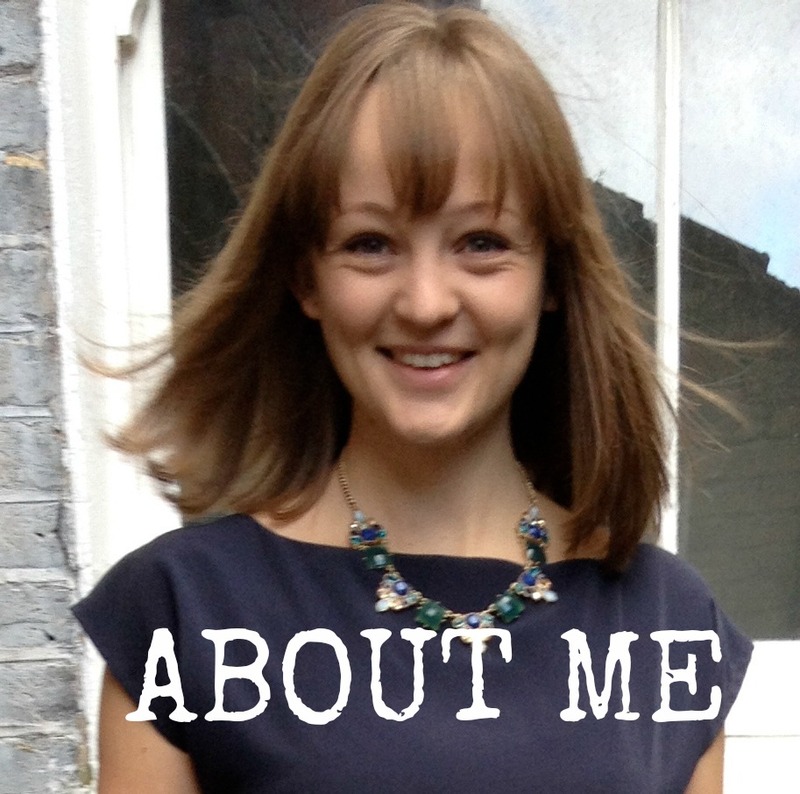 I'm 5ft 3" and wouldn't want to go much shorter as not a lot of bending can be done! I was worried about fitting the neckline but I went with it and it actually sits quite well. I wouldn't be happy if it was a dress but for a pinafore it feels right. I cut the size 4 for reference. 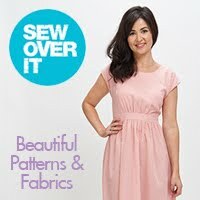 I'm not sure I'll be making another of these, although I am slightly tempted by the pattern suggestion of faux suede! It would be interesting and fun but this design does require nice crisp pressed edges which could be a challenge with that particular fabric. 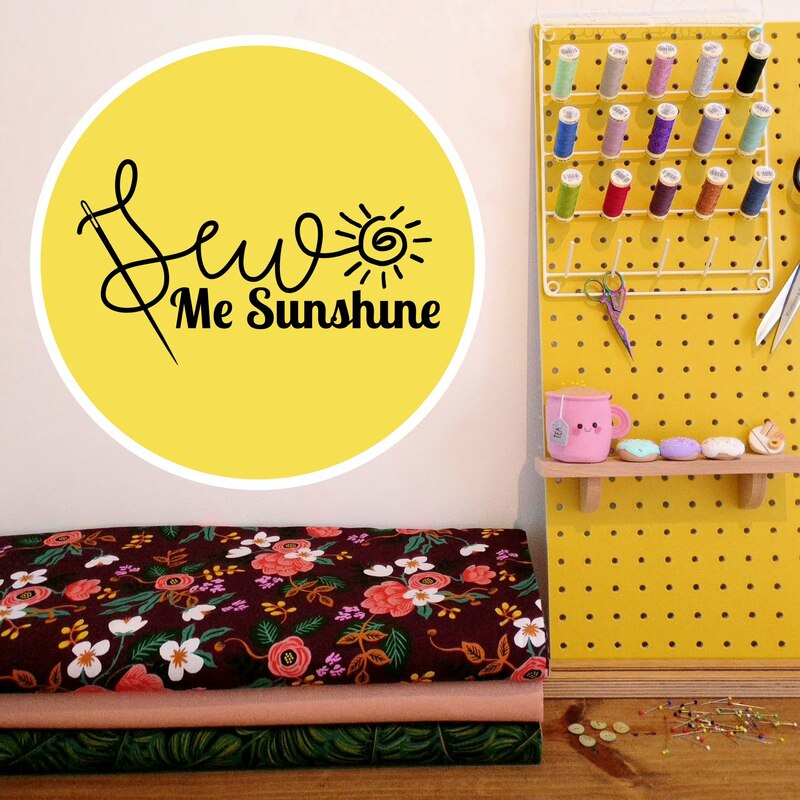 Have you been doing any slow sewing this month? 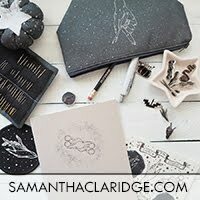 What are your favourite time consuming techniques? Your Dani looks fantastic, Fiona. The plaid was such a good choice and it looks lovely for the season. 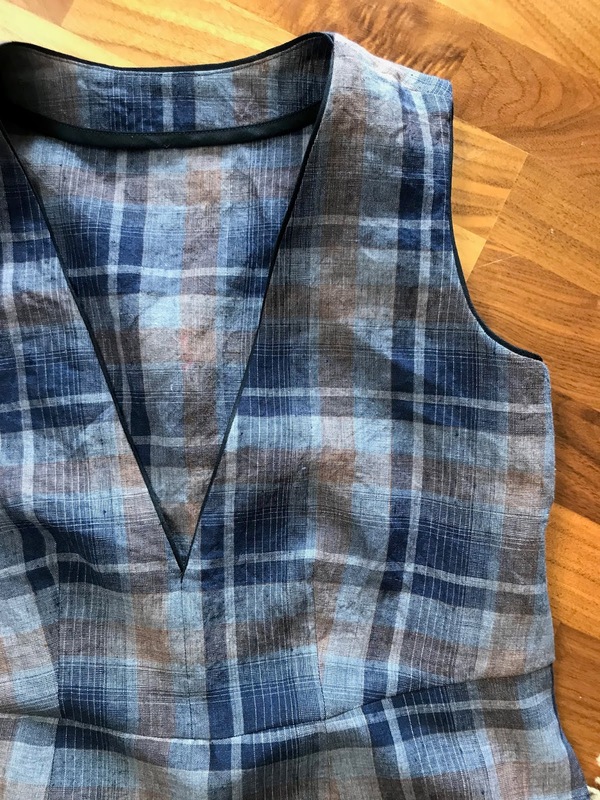 I became smitten with this pattern as soon as Seamwork released it and found some gorgeous black deadstock Ralph Lauren corduroy. Do you think corduroy will work for Dani? Thanks very much Nichole! I'm really pleased with how the pattern and fabric pairing turned out. Your dress is gorgeous! I love the binding finish on the inside it’s a lovely detail. I'm really pleased with the binding! It has been a while since I have spent that long on finishing techniques and it is so worth it. Thanks very much! 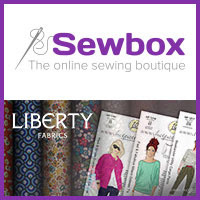 O I think you can do much nicer sewing without a serger! It is so easy to fall back on it as a quick finish but actually things like binding and french seams are so much nicer. Love this and am just about to make my own so very helpful thank you! I'm 5"8 so I will definitely lengthen! O yes definitely lengthen! I wouldn't want to go an inch shorter. At least if you've lengthened you can always take a bit more off again. Hope you enjoy making yours!